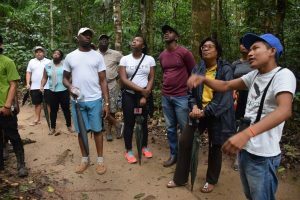 A 19-year-old high school dropout, Kendrick Andrew who got a new lease on life by securing a job as a tour guide for the Atta Lodge located in the Iwokrama Rainforest, is determined to develop himself academically regardless of his challenges. Andrew explained that familial issues led to him dropping out of school, however, that will not hinder him from achieving his goals. “I do regret that I dropped out of school. I told myself I missed a lot of work. I should have been somewhere else already if I had attended Secondary school,” he was quoted as saying by government’s Department of Public Information (DPI). Kendrick, who hails from Kato Village, North Pakaraimas, Potaro-Siparuni (Region Eight) relocated to Annai in the Upper Takutu-Upper Essequibo (Region Nine), where he enrolled at the Bina Hill Institute and studied Music, Art, Agriculture, Basic Mathematics and English, Natural Resource Management, Forestry, Cultural Skills, and Tourism. After completing his studies, he sought employment at the Rockview Lodge but things did not work out as anticipated so he moved onto the Atta Lodge. At first, it was a bit tough but Kendrick learned all the responsibilities by accompanying other tour guides and within a short time became well-versed in the ways of the forest. Much of his knowledge of the trees was imparted by his grandparents, but the scientific aspect was learnt through his interaction with the more seasoned tour guides. Now, the young man is one of the head tour guides at Atta Lodge. He has a pleasant personality and is willing to go the extra mile to ensure guests at the Lodge are comfortable and this has earned with him a high level of respect from his colleagues. The youngster, who has a fearless persona, aspires to attend the University of Guyana (UG) and was not shy in letting his dreams known to Minister of Public Telecommunications, Catherine Hughes, who was on an outreach in Region Nine and stopped by the Lodge. Intrigued by his story and willingness to further his studies, the minister committed to assisting him with entry into the tertiary level institution. 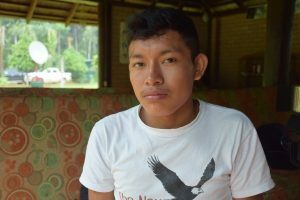 The ambitious young man is grateful for the opportunity and training he is receiving at the Atta Lodge and is encouraging other youths to pursue academic qualifications so that they can improve their lives and that of their families.